Dr. Jennifer Loewen and Diesel. Photo by: Christina Weese. 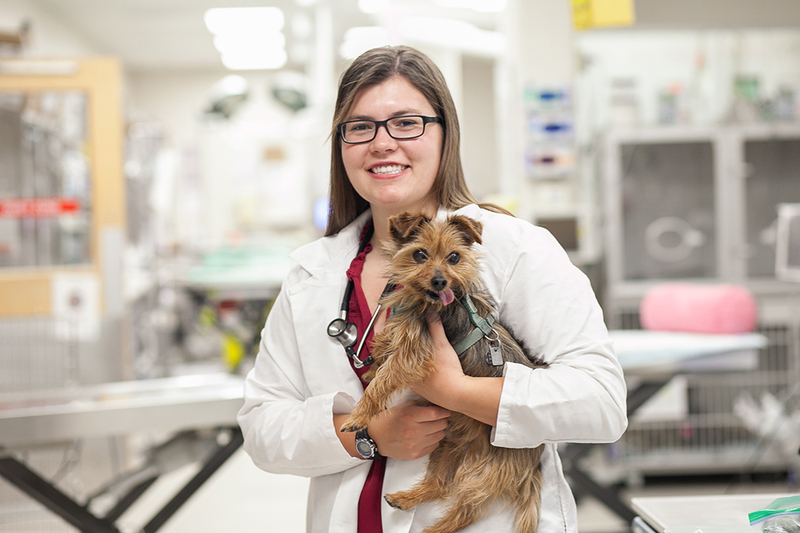 Becoming a veterinarian was never a question for Dr. Jennifer Loewen, who had her career planned out since she was attending elementary school in her hometown of Winnipeg, Man. But what did come as a surprise to her was the clinical specialty she ended up following: veterinary emergency and critical care. “If you would have asked me at the beginning of vet school, this is not where I would have imagined myself being,” says Loewen, who became a faculty member at the Western College of Veterinary Medicine (WCVM) in October 2018. While veterinary emergency and critical care is a growing specialty, it’s still relatively rare in the veterinary community. Canada has about three dozen board-certified specialists in emergency and critical care — Loewen is the only one practising in Saskatchewan. After Loewen graduated from the WCVM in 2014, the options of small animal surgery and internal medicine were high on her list. But emergency and critical care seemed to be a “good in-between of both of those worlds,” she says. Loewen’s first step was a one-year clinical internship at Iowa State University where she had more exposure to the clinical area. After her internship, Loewen began an emergency and critical care residency at the University of Wisconsin’s School of Veterinary Medicine. Once she finished her residency in 2018, she returned to Saskatoon. “I didn’t specifically plan coming back to the WCVM, but it had been in the back of my mind as something that I would definitely consider. It’s close to home, I really like the city, I was familiar with the school and I felt like I could add something to the program here,” says Loewen. Loewen, who is now part of the veterinary emergency and critical care team in the WCVM’s Veterinary Medical Centre, looks forward to building the hospital’s clinical service as well as a support system for clinical interns and veterinary students who work and train in the WCVM’s emergency and intensive care unit (ICU). Danielle Mierau, a registered veterinary technologist (RVT) and a certified veterinary technician specialist in emergency and critical care, remembers Loewen when she was a veterinary student. “She was a fantastic student so I was very excited to hear that she was coming back as a criticalist [emergency and critical care specialist],” says Mierau, a member of the WCVM’s emergency and critical care team. The collaborative nature of her role is another plus. While some consider an emergency and critical care specialist to be a “jack of all trades, master of none,” Loewen doesn’t mind the variety. She enjoys getting together with other members of the clinical team to discuss cases, brainstorm ideas and solve problems together. But what’s the best part of her job? For Loewen, it’s the joy of sending a recovering pet home with its happy owner — especially when no one was expecting a good outcome.